In a land ruled by a murderous boy-king, each dawn brings heartache to a new family. Khalid, the eighteen-year-old Caliph of Khorasan, is a monster. Each night he takes a new bride only to have a silk cord wrapped around her throat come morning. 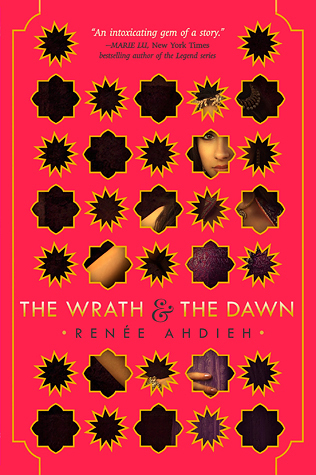 When sixteen-year-old Shahrzad’s dearest friend falls victim to Khalid, Shahrzad vows vengeance and volunteers to be his next bride. Shahrzad is determined to not only stay alive, but to end the caliph’s reign of terror once and for all. Night after night, Shahrzad beguiles Khalid, weaving stories that enchant, ensuring her survival, though she knows each dawn could be her last. But something she never expected begins to happen: Khalid is nothing like what she’d imagined him to be. This monster is a boy with a tormented heart. Incredibly, Shahrzad finds herself falling in love. How is this possible? It’s an unforgivable betrayal. Still, Shahrzad has come to understand all is not as it seems in this palace of marble and stone. She resolved to uncover whatever secrets lurk and, despite her love, be ready to take Khalid’s life as retribution for the many lives he’s stolen. Can their love survive this world of stories and secrets? Ahdieh’s writing style is simply amazing. She weaves words together into sentences that transport you to a different world. Reading through this book, I simply felt as if I lived in the Arabic world, like I had before as a child watching Aladdin. The story however is much less Disney (which for me is a good thing), and much more realistic. What also made this story for me, is how realistic the characters seem. They all act independently of each other, but still of course impact each other. Sharhzad, our main character, is quite head strong and stands up for what she believes to be right. She knows it might get her killed in the palace, but then again, that was probably going to happen anyway. It’s great to read from her perspective, as this attitude makes her really funny as well. As we continue the story, we also learn that Khalid isn’t nearly the heartless king he appears to be to the outside world. It’s nice to see him evolve and learn a thing or two from Sharhzad as well. It’s written from multiple points of view. Though, I’m still a bit confused at the reason for this. I’ve not seen much added perspective from those different points of view. However, I didn’t mind very much, as it was done in a consistent manner, right from the start. Perhaps those other perspectives will become more important in the sequel. Besides the odd synopsis on the cover, the book is just beautiful. I love the end pages and the deckled edges. Just gorgeous! There were a couple of things in the book I especially appreciated. A story where some rich king keeps a girl locked up in his castle, obviously is very reminiscent of Beauty and the Beast, which then immediately brings me to Stockholm syndrome (someone falling for their captor). It is luckily quite obvious from the start that she’s not actually locked up, come to the palace on her own volition (and some more things, but that would get spoilery). From other perspectives it’s even suggested that she must’ve changed, because how else could she stay with such a monster. I’ve even got a favorite quote from this one: “A shared history does not entitle you to a future, my friend.” I don’t think I’ve ever read a better (yet concise) answer to the ridiculous notion of friendzones. Usually, I’ve got a lot of trouble why certain books are so hyped (even when I thoroughly enjoy them). For this novel however, I just can’t believe it’s not been hyped up more. I absolutely loved it! There’s so much more I’d like to tell you about this book, but if I did you wouldn’t need to read it yourself anymore. Mostly, I’d just like to gush about all the lovely characters and what they do, think and say. So, please read it now, so I can talk to you about it! I didn’t read the review because I bought this book last week and I’m super excited, I want to go into it unspoiled. I’ve heard great things about it. Well, you can obviously see I loved it, I hope you will too. Let me know what you think when you’ve had the chance to read it!